Working at Lords & Ladies Salon and Medical Spa is not just a job, it is an investment in yourself and your future! With compensation, commissions, benefits, and education that far exceeds the industry average, Lords & Ladies is the place to build your business within our business. By offering over 700 hours of continued education to our stylists and staff each year, we pride ourselves in being a leader in education for our industry and among one of the most highly trained salons in the nation. Our Douglassville Education Center is a multi functional space where we host classes, staff meetings, open houses, and special events throughout the year. Whether you are right out of beauty school and just starting your career, or you’re an established stylist looking to take your career to the next level, Lords & Ladies offers educational opportunities that are tailored to your specific needs! Available for Licensed Stylists to attend sessions beginning every February, July and October. Focusing on the building blocks to success, our Graduate Classes help propel your talent to the next level! These classes are held at our Education Center on Monday, Tuesday and Wednesday. Classes are taught by our own Lords & Ladies Education Team. Upon successful completion of our Graduate Program, our New Talent Stylists attend classes every Thursday for eight weeks. The strongest trees have the deepest roots, and these classes provide a great opportunity to dig your roots down deep! 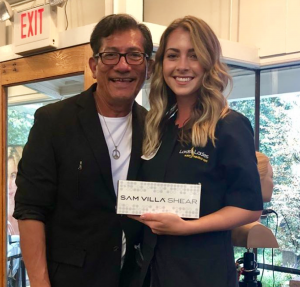 Offered when stylists are transitioning from school to behind the chair, or as a great refresher for those who want to perfect their skills and more practice perfecting their craft. The New Talent Classes also begin every February, July and October. L’Oreal Professional Artists teach New Talent Classes. At Lords & Ladies we host world renowned Platform Artists to our Education Center. These industry leaders teach our entire staff of over 200 service providers on all areas of the beauty business. These educators are the best of the best in the industry worldwide, and are able to educate our team on the most current techniques, styles, and technology. Platform Artist Classes are offered as often as twice a month throughout the year. Our Education Team is hand selected to represent Lords & Ladies all over the world by attending educational experiences that they bring back and share with our team! The opportunities are endless, we have participated in L’Oreal World Tour bi-annually and have been invited to the Color Trophy Award events. Since 2008, we have been to multiple London Academies, Paris Academies, Amsterdam, Australia, Barcelona, Rome, Madrid, Milan, Lisbon, Portugal, Ireland, and Denmark. Each year our Educators and Advocates visit the L’oreal SOHO Academy and participate in the Eufora YOU School for Cutting Foundation 1 and Foundation 2. In each of our seven salon locations we have a Product Advocate for each premium product line we carry. Advocates are provided with additional education from the manufacturer to take that knowledge back to their team in the salon. By becoming an expert in these premium product lines, they are able to assist in our new talent, graduate, and platform artist education. To start your career with us, click here to view available positions.